The International Consortium has developed a number of tools and resources to assist court in taking these steps. Thinking of Implementing the International Framework for Court Excellence? provides an overview of these three steps. Teaching the International Framework for Court Excellence is a “how-to” (“train the trainers”) guide for instructors, facilitators, organizers, and program developers of a one-and-a-half training program on the Framework. It prepares the potential trainers to effectively teach a workshop covering the concepts and tools of the Framework. 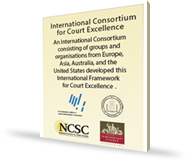 © 2014 National Center for State Courts U.S.A. — for the use and protection of the members of the International Consortium on Court Excellence provided that the members of the Consortium will have a non-exclusive, perpetual license to make use of the work in support of the goals of the Consortium.